I hope you enjoyed reading my article and I wanted to add a few things. I cannot say much on the marketing strategy, because this is not my line of work and I don’t know much about that. But what I would say, is that before oracle acquired sunopsis, their product was already build on the ELT approach. Another thing, this post is about the ELT approach and oracle’s product was never mentioned, but I will refer to it since you did. ODI is capable of doing ELT, ETL and ELTL, it all depends on how you decide to design you data integration process. Although, by default ODI is constructed to use the ELT. About the ELTL, in the approach I talked about, the second “L” never happens, since after the first load, the data never leaves the target DB. 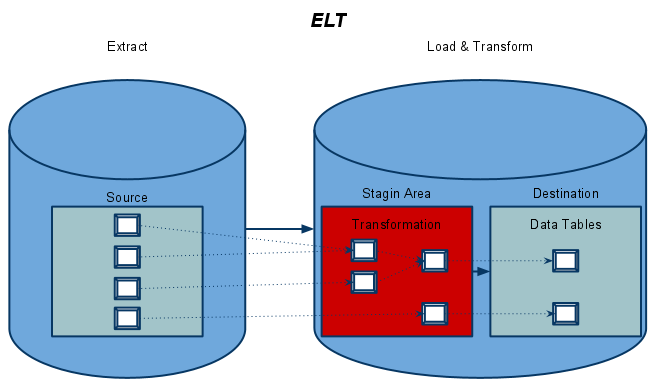 All the transformations happen within the DB, until the data is integrated into the destination tables as part of the “T” process. Igor, your point of view is convincing :). I am working in OWB and ODI and doing ‘ELTL’ as after extractin we load data into destination DB staging schema, then transform and load again into target data warehouse. I feel only difference between ETL and ELT that we are not using extra machine for staging area, instead we are using destination machine. If your target DB machine is not powerfull you will be in trouble.